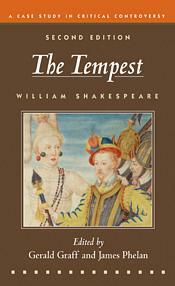 Designed for "teaching the conflicts," this critical edition of Shakespeare’s The Tempest reprints the authoritative Bevington text of the play along with 21 selections representing major critical and cultural controversies surrounding the work. The distinctive editorial material helps readers grapple not only with the play’s critical issues but also with cultural debates about literature itself. The second edition includes four new readings, revised headnotes that more helpfully contextualize the critical essays, a portfolio of visual representations of Caliban, and an appendix on writing about critical controversies and The Tempest.